Help Me Get to the Global Rainbow Catholics Conference! Two years ago, I was at the inaugural conference of the Global Network of Rainbow Catholics in Rome, coinciding with the start of the Bishops’ Synod Assembly on Marriage and Family. That conference set up a steering committee, to put the organisation on a sound footing to continue solid work to promote full LGBT inclusion and equality in the Catholic Church. The steering committee has now completed its work. At the end of this month, the GNRC will be formally constituted at a conference in Rome. I will be there. In addition to the formal approval of the body’s statutes and the election of a board, this will be very much a working conference, with four study groups preparing plans for continuing work. I have asked to be allocated to either the group working on tools and strategies for advocacy with Catholic bishops, or that tasked with improving pastoral care for LGBT Catholics. In addition, I will be urging the conference to send a strong delegation of LGBT Catholics to the 2018 World Meeting of Families in Dublin, where by our simple presence we can provide valuable testimony to the reality of LGBT Catholic lives, present empirical research to counter the prevalent myths promoted by our enemies, and possible even address the full assembly. However, to get there I need your help. Please support my “Go Fund Me” page. 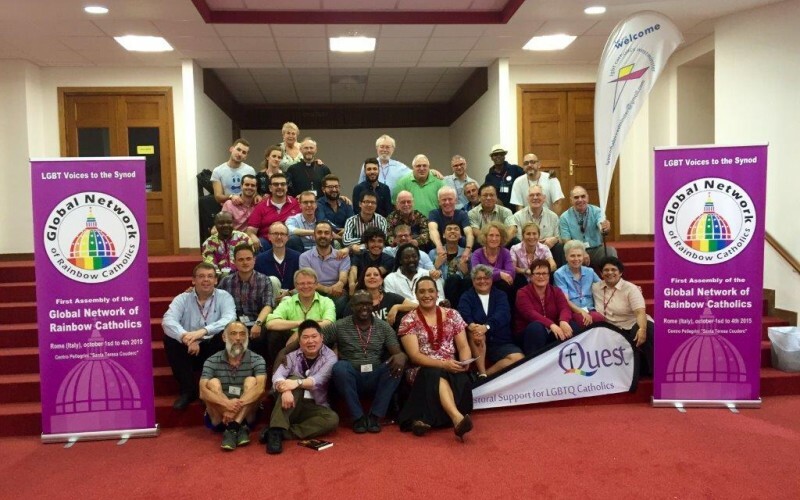 It´s been almost two years from the first time the Global Network of Rainbow Catholics gathered, for its genesis in Rome on October 2015 and in parallel to the Extraordinary Synod of the Family. Since then Pope Francis, male and female religious, lay members and our local LGBTI pastoral care groups pronounced diverse speeches or took different actions related to LGBTI issues within the Catholic Church. While some of them are great approaches for justice and inclusion for LGBTI´s and their families, there are still many others that sustain the need to keep an open and direct dialogue with the whole Church and society. “We have made a lot of local efforts, but indeed a single and global voice with our lay Community, the Curia and the Vatican itself is needed”, explains Benjamin Oh, member of the GNRC Steering Committee and part of Acceptance Sydney (LGBTI Pastoral Care Group based in Australia). “We have made these journeys as independent initiatives, when there are a lot of synergies we can develop together as a Global Network”, complements Benjamin O. So recognizing the benefits of the GNRC existence we are pleased to inform you that our 2nd GNRC Assembly will be held from 30th November to 3th December 2017 in Munich-Dachau (Germany). The conference title is “Hear a just cause” from Psalm 17. “Our time has come for social justice and our plea must be heard because it is indeed a just cause – and above all, urgent!” said Joseanne Peregin, also a member of the GNRC Steering Committee and part of Drachma´s Parents Group (LGBTI Pastoral Care Group based in Malta).